Albert Einstein insisted that “Coincidence is God’s way of remaining anonymous.” Perhaps he was right. Sometimes those things that happen to us seem just too good to be true. Tonight, I faced a similar sort of moment. the fever of life is over, and our work is done. But sleep and holy rest were not to be. I was thinking that there must be some static between here and the ear of the Divine. If I’m not going to sleep, perhaps I might do some work or some reading. So off to the study I go. Sit at the laptop and think to myself – “If I only could find some some Rolaids!” I thought I had bought some at one point, but where did I put them? I know that my efforts to find them pre-prayers was a fruitless endeavour. No sooner had my mind meditated on the assets of antacids when our fabulous feline Molly was running all about the room in a manner akin to what I might imagine televangelist Jack Van Impe might be like when he finds out what kind of riff raft God accepts in heaven! She was moving —-quickly. I raised my voice, “What the heck are you doing, Molly?” I did not expect an answer from her, but I queried her nonetheless. Had she spoken, I would have been like Jack Van Impe… well you get the idea… Again she bolted across the room at lightning speed. Then I noticed she was pushing something in front of her. 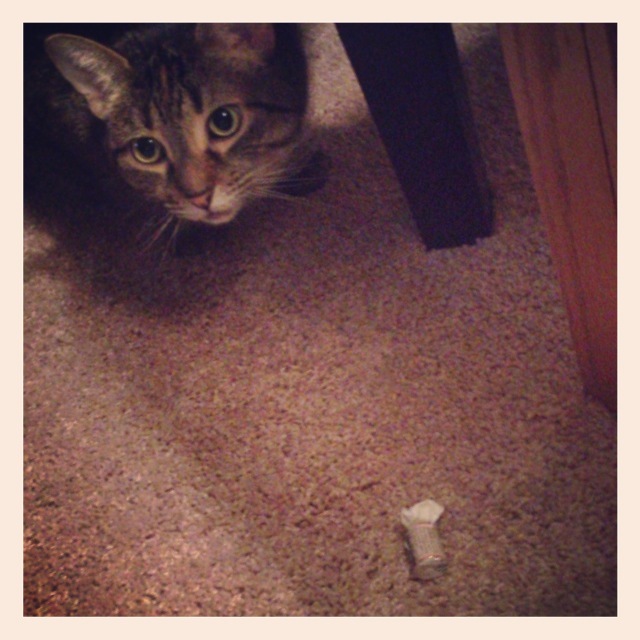 She was deftly stick-handling something between her left and right paws, but what was it? “Molly, what do you have there?” She turned and looked at me; I looked at the floor….Good Lord!!!! She has a third of a roll of Rolaids! She had the relief I was looking for. Molly gladly surrendered the chalky treat and 15 minutes later I have belched, Molly is asleep and the world seems right. How do I spell relief? – M-O-L-L-Y!!!!! Coincidence? Answered prayer? – Not sure it matters, I just know I feel a lot better! But first, one more prayer….. Thank you for a laugh this morning Kevin! Glad you felt better! No coincidence here. Molly is a player, an example of one of God’s creatures doing his will. I don’t think we can be as fatalistic as Jaques in Shakespeare’s play but still we do God’s will…even if we are a kitty. Wasn’t that a delightful and entertaining way He used! This is what was said in “As You Like It”…somebody seemed to be having a down day.